One Final Summer Ride I went on yesterday. Certainly felt like the end of summer; subtle signs of fall blowing sand on my sandwich, the no longer enhancing summer tan on my arms, the almost desolate beach and even a solemn ride along the Far Rockaway Parkway whizzing by the red brick wall that are the projects. A few little white silhouettes playing cricket and a Jamaican man kite'ing his flag slightly below the JFK headed landing plane. 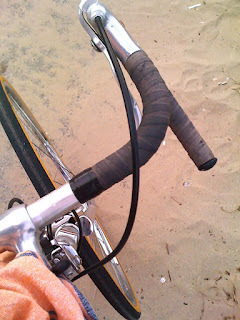 Felt like a one final summer ride on my worn out Panasonic. I will finally put up A Good Photomentery documenting this ride. So stay tuned over the next day or so. Wor(l)d is back at is best.